If there’s one thing I’ve learned from film school or more correctly, dating fellow film students, it’s to beware of aspiring male directors who compare themselves to Eisenstein and Godard, especially when they’re the son of a studio president only given a shot because of nepotism and for their first project are deciding to finish what some say would have been Bruce Lee’s Gone With the Wind-- his uncompleted final film, The Game of Death. Yet that’s exactly the type of director we meet just moments into Better Luck Tomorrow director Justin Lin’s largely uneven yet mostly hilarious 70’s mockumentary that begins after we learn that just twelve minutes of Game of Death had been shot with Lee wearing that legendary yellow costume (made famous by Uma and Quentin in Kill Bill) before the master’s untimely death at the tender age of 32. Instead of honoring his memory and the beloved films Lee had finished, the studio decides that it’s time to exploit the legend and set about finishing Game of Death by searching for a new Bruce Lee stand in to sort of photograph him wandering and possibly getting into a few fights in order to pad the running time and sell lots of tickets. Ronny Kurtainbaum (Joake Sanvig), a temperamental young director just coming out of adolescence himself without a cinematic clue save for his references to foreign greats, aligns himself with veteran casting agent Eloise (the hilarious frequent scene-stealer Meredith Scott Lynn) in weeding out the potential Lee substitutes from the overwhelming number of turnouts at the cattle call. Among the frontrunners are Roger Fan’s Breeze Loo, a Bruce Lee styled B movie actor who swears that acting is only in the eyes and that actors shouldn’t demean themselves to stage-fighting when there’s stuntmen to be hired, gorgeous and young Cole Kim (Sung Kang) who, along with his domineering Columbian girlfriend turned agent ventured out from racist Alabama to try and launch Cole’s career. Rounding out the pack is a 100% Caucasian looking Tarrick (McCaleb Burnett) who calls himself half Chinese and feels like he has the greatest shot since he’s sleeping with the casting director’s assistant, Indian Raja (Mousa Kraish) who became a doctor just to follow through on a promise to his dying mother only to give it up to become an actor once he’s an official M.D., and many others including a former TV actor turned vacuum salesman and a Oscar winner from New Zealand. Filmed in a grainy 70’s style color palette with an emphasis on orange and yellow and a belief that gaudier is funnier (which, in this case, it mostly is), Lin’s likable, innocuous comedy was an Official Selection at Sundance and thankfully reunites the talented director with excellent material such as his terrific directorial effort Better Luck Tomorrow before he moved to more commercial fare such as Fast and the Furious: Tokyo Drift. Fun and original, co-writers Lin and his colleague Josh Diamond layer their script with the belief that-- similar to an early Woody Allen making films in the era in which they are shooting-- pouring on the jokes and ridiculous situations is the key to entertainment do in fact hit much more than they miss, even when some of the outrageous comedy of the beginning starts turning repetitive later on (inevitable for the format). Despite this, Finishing the Game has enough hilarity that you may find yourselves wanting to watch it twice just to pick up on or re-experience all of the mockdocumentary's jokes. 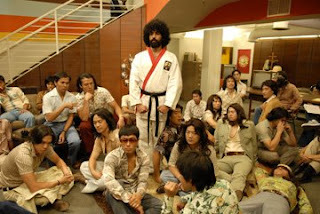 And while those familiar with Lee’s story know that this isn’t the crew who would end up taking over Game of Death, Lin and Diamond manage to get across some deft points about Asian stereotypes and the film business that elevate the work from simply being an irreverent time waster to a comedy that sometimes culls us laughs from truth.